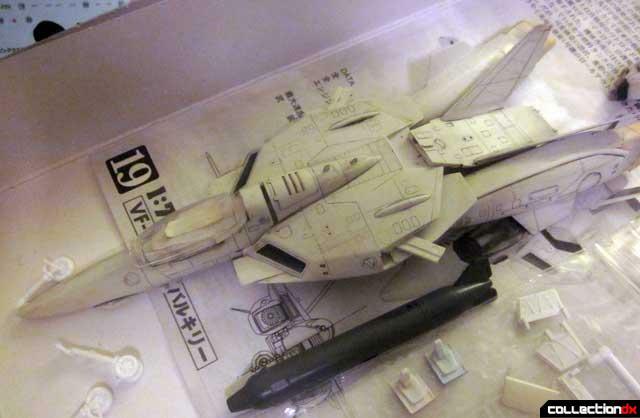 In 2001 Hasegawa released a new line of much needed modern 1/72 Valkyrie Fighter model kits. 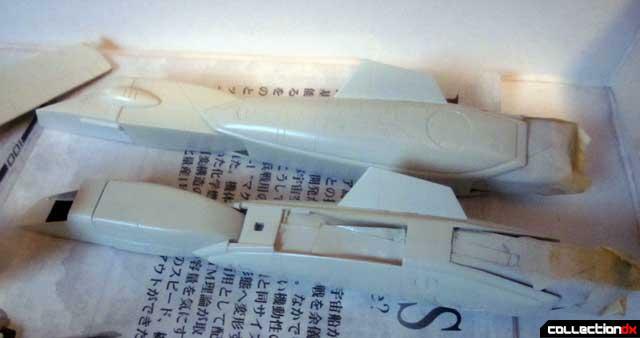 It is hard to believe neither Bandai, Arii or Imai ever released a dedicated Valkyrie Fighter kit in 1/72 in the 1980’s. 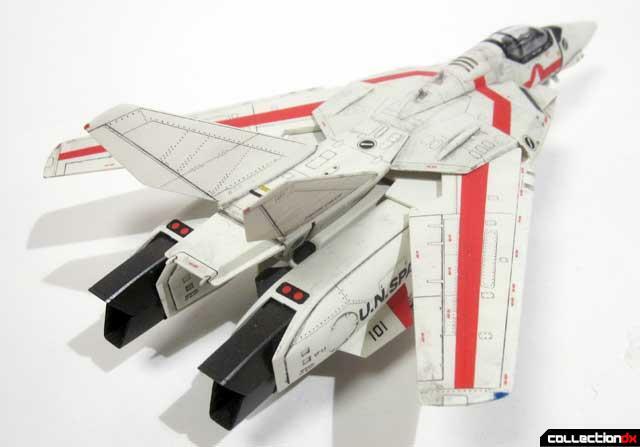 Sure they released variable kits and Super kits but never the standard Valkyrie Fighter. A few resin kits were released in the 1990’s but they were difficult to locate and extremely expensive. 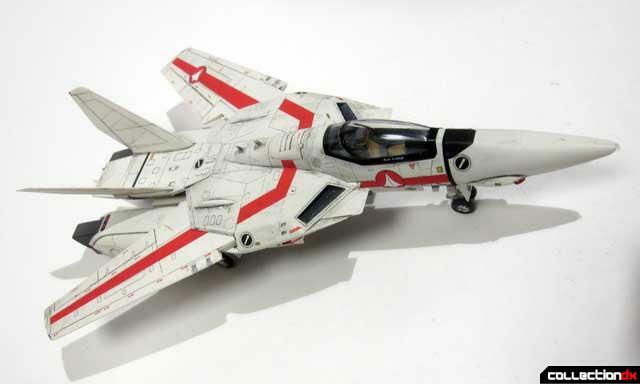 It was a welcomed relief to hobbyist when Hasegawa, who was at the time new to the Sci-fi and anime model kit market, released brand new kits of the iconic VF-1 Valkyries Fighters. 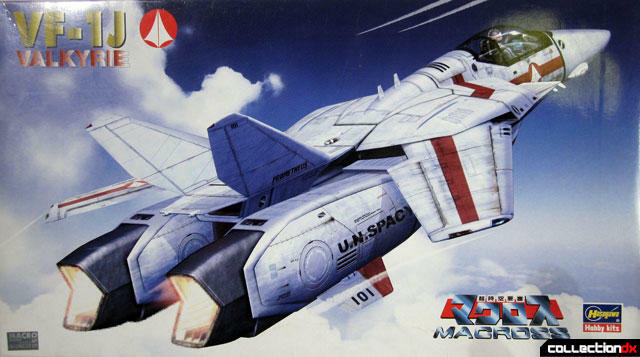 To me it was a match made in heaven, Shoji Kawamori’s real robot fighter designs combined with Hasegawa’s nuanced tooling renditions of real aircraft made these kits into some of the best Macross model kit releases up to that time. Even today these kits hold up very well and will have a long life on the model dealers shelf for years to come. The real downside to these kits it that they are very difficult to build. Many steps need to be done correctly while building the kit to ensure that it all comes together correctly in the end. 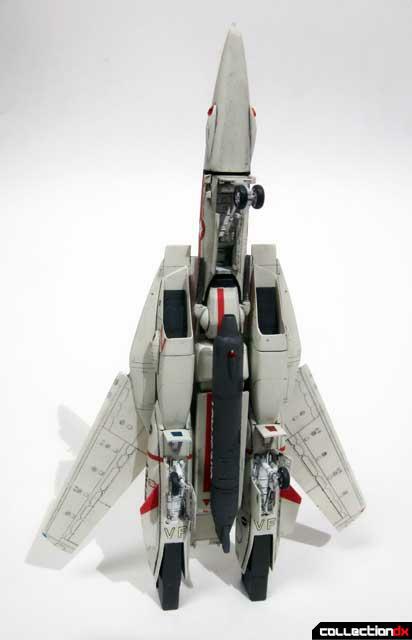 I originally built kit Kit No.19 VF-1 A/J/S a few years ago and reviewed it here for CDX. 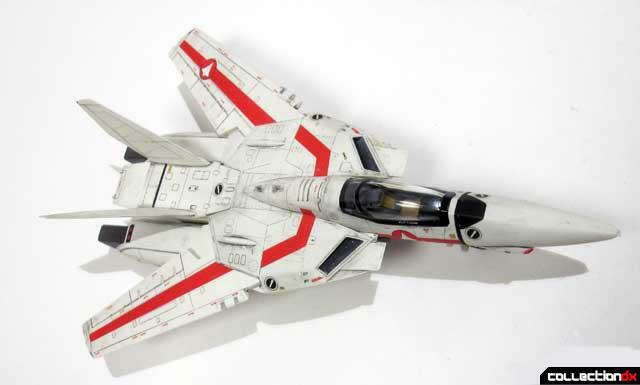 The kit was essentially a compilation of the first three kits that were released: No.1 VF-1A, No.2 VF-1J and VF-1S with a paired down decal sheet that deleted certain markings that were specific only to those three original releases. Since those first three kits are now out of production I thought it would be great to revisit the first three VF-1 kits again and do a proper review of each of them. 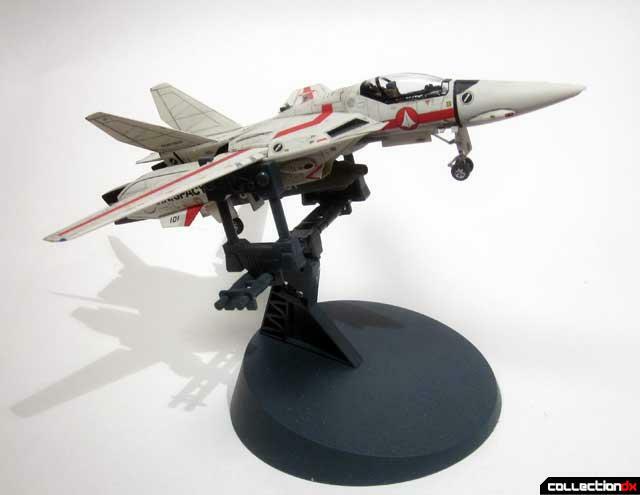 Hasegawa VF-1J comes boxed with 1x set of sprue, 1x Clear, 1x decal sheet, 1x instructions. 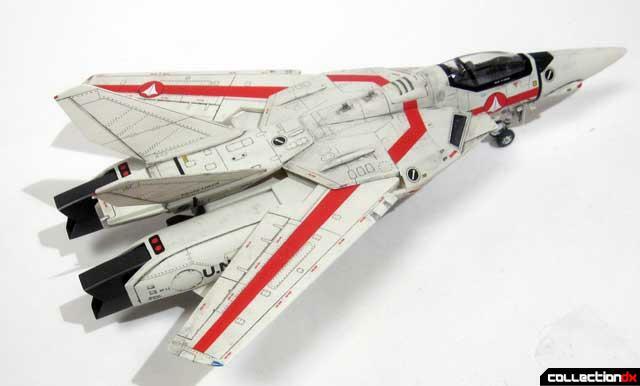 The option of this kit is that the kit can built with the landing gear up or down. 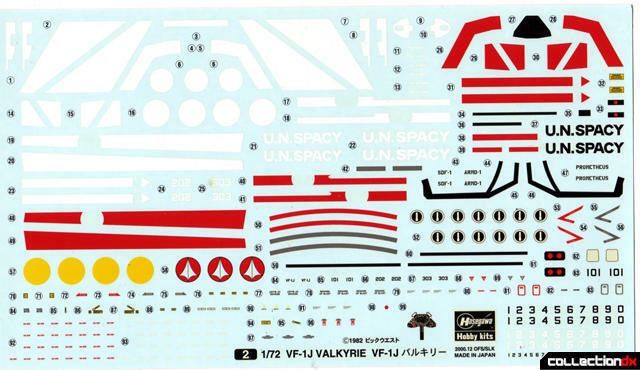 Three schemes included with this kit include on the decal sheet are Hikaru TV VF-1J, Milia VF-1J TV Red Scheme, Maximilian TV VF-1J Blue scheme. 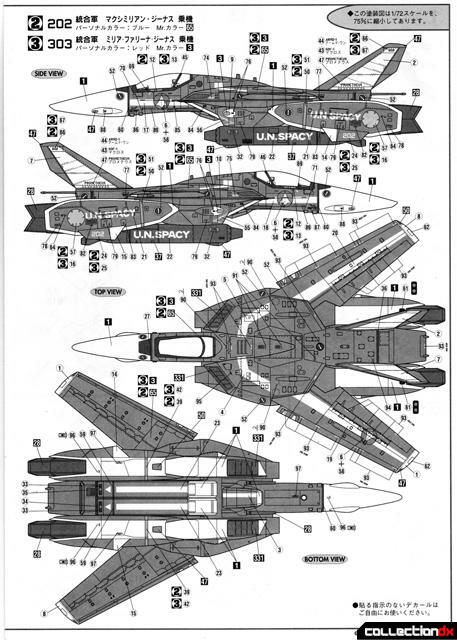 The decal sheet includes numerous other markings and numbers to build a custom VF-1J. What is different about this build and Kit No 19 I built a few years ago is that I mostly wanted to build this kit out of the box. 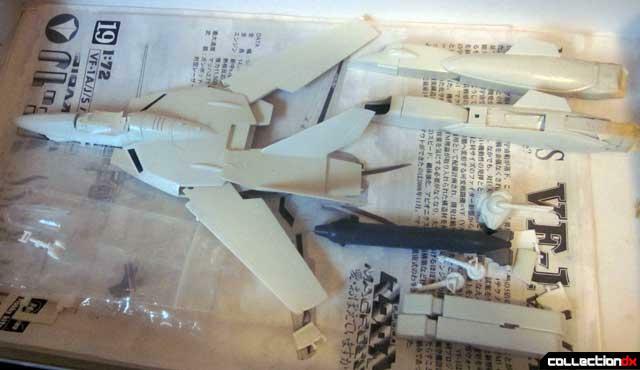 I only added two photoetch parts to this kit, the spine antennae and the control handles from the Hasegawa VF-1 photoetch set, which will get its own review at a future date. I wanted to give the readers a look at what can be built straight out of the box with these kits and what can be added from ones spare parts to improve the look of the kit. 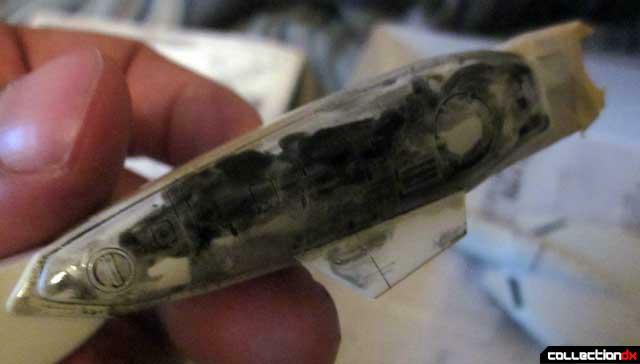 The interior parts were painted first using Tamiya paints, these included the cockpit and inside the legs before they are closed up and glued together. I used Alclad metallic paints for the exhaust “feet”. 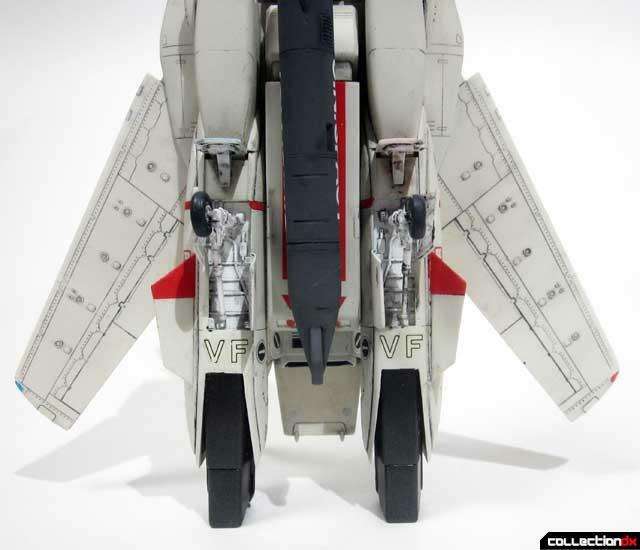 Although there is a photoetch part for the twelve inner foot spines included the VF-1 photoetche set, they can easily be made with spare thin plastic sheets. 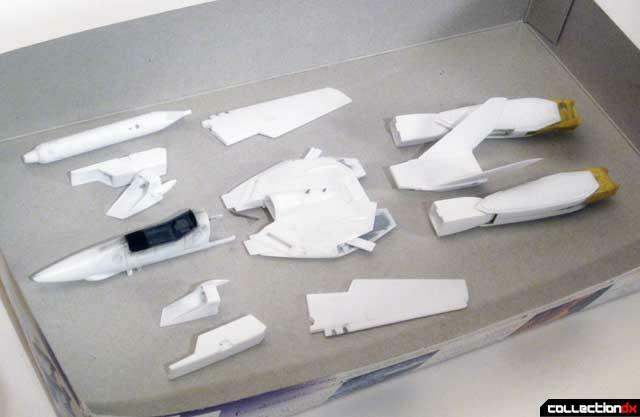 The breakdown of the kit is broken up into six parts: The cockpit, the body, the rear rudders/backpack, the legs and the arms. I added the photoetch handles to the interior, as it just seems very sparse in the cockpit without them. I also added a rear wall with thin sheet plastic, as the seam would be impossible to fill. The Valkyrie body has a few issues. First the area in front of the wing has very little area to glue and always develops a hairline fracture as due to the stress of the wings being in an area so close to it. Just make sure you add a sufficient amount if glue to that area and be careful with handling that area. Second, the hole on the top of the body has to be glued correctly as you can easily destroy the surface of the top of the body. Although I did not know it at the time, this part is made this way for the Super Armored kits so the backpack can sit correctly on the top of the aircraft. The third is a tradeoff. There is a photoetch part in the set that fills up the open hole where the wings fold in. Unfortunately if you want the wings to fold you either have to modify the part or leave it off. For the sake of out of the box I left it open so I can fold the wings. The rear backpack rudder area careful alignment are needed with the parts and make sure the backpack top is fully glued to the bottom as it also has a tendency to develop hairline cracks. The legs have a lot of areas where the surface detail can be easily be sanded off. Be very careful when gluing those parts together. I had some issues with gluing the front intake to the rest of the leg. I simply forgot how I assembled it the first time around. 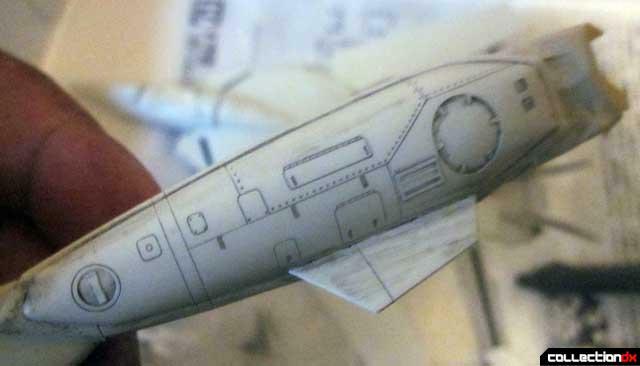 You should glue those parts together to get a better overall look when finished. Another aspect of this kit that I wanted to do different was actually using the paints that Hasegawa suggested for the kits. If you know Hasegawa they have been using Gunze paint numbers for years. Of all the years I have built Hasegawa kits I have never used Gunze paints to paint their kits but substituted Tamiya or Model Master paints. To get that real “out of the Box” feel for this kit I decided I was going to use Gunze Paints for this kit. First a little background on my history with Gunze. In the 1980’s I attempted to use Gunze Aqueous Acrylic paints on some kits I had and it seems the paint just never dried. In fact I still have one kit painted with Aqueous and it is still tacky. I can assure you that it was properly mixed, etc but it just never sprayed well out of the airbrush and never looked well on the kits I was painting. I never touched Gunze paints again until recently. At my IPMS model club we have another member who builds great Anime/Sci-Fi kits and I was just impressed with his semi-gloss finished he was doing. He told me he used Gunze Mr. Color and I told him my issues with Aqueous all those years ago. He said, “Don’t use those paints they never seem to dry and are tacky to the touch, Use Mr. Color!” Wow I was not the only one who experienced those issues with Aqueous but it opened up the world of using Gunze again. The real issue is that the paint is very difficult to locate here in Southern California, with only one store carrying the product line here. At $3.99 a bottle it is an expensive process to use Mr. Color on kits. This here is my first major usage of Mr. Color on a model kit per Hasegawa’s instructions. Hikaru’s fighter is not white but an off white grey/tan that it seems only Mr. Color produces. It really is an odd color with no other equivalent with any other paint company. At this point with the kits I tend to paint all the built sub components separately but glue the cockpit and backpack to the body. When I first built kit No. 19 a few years ago I discovered how to replicate the classic Hasegawa panel line finish, but in that kit I had already put the decals on. This time I was able to do it correctly without any decals applied. Spray a coat of gloss paint to seal in the Mr. Color paint to protect the finish. First mix up a coat of acrylics tube paints of two parts black, one part burnt umber thinned with thinner. I use the Mona Lisa thinner and paints as it does not haze the finish. I then apply a generous coat of wash to the parts. Then with plastic polish I rub out the excess wash with a cloth. It is dangerous the first time one does it but I promise you will get the hang of it quickly. Once all the parts are washed I begin to put the decals on. I decided to build Hikaru’s classic VF-1J from the Macross TV series. 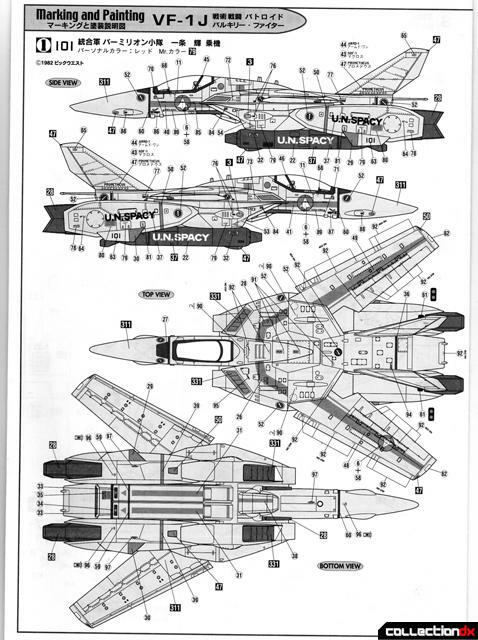 These markings are also included in Kit No 19, but the VF-1J Max and Milia markings are not included. There are about seventy decals to apply to this kit so take a few days to apply them, as you will be rewarded with a very nice looking kit in the end. I added the two “VF” on the lower legs as a nice nod to the original 1980’s Arii/Imai/Bandai kits as I feel no Valkyrie kit feels right without them. I also decided to paint the VF-1J head with a grey visor as another nod to the classic Arii/Imai box art from the 1980’s. Once all the decals were put on I finally glued all the major components together and did some final washes and paint touch ups. Finally I added a flat coat over the decals and finish to even out the entire kit together. 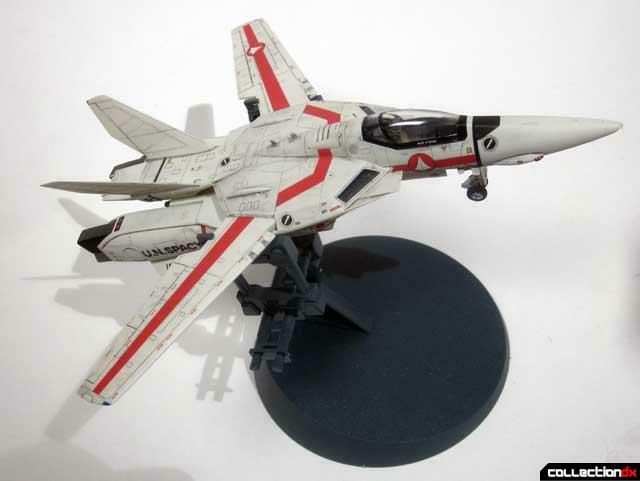 As you can see out of the box, this kit builds into a great little valkyrie and captures the Macross look beautifully. Overall I am glad I went with Mr. Color for this finish as it has the wonderful semi-gloss finish that I have grown to love about Mr. Color. Although a lot of work I am glad I was able to get another finished Hasegawa kit in my collection. Thank you Veef for selling me this kit a few years ago. Although this version of the kit has been out of production for years, many were made and can be easily picked up for under $20.00 today. 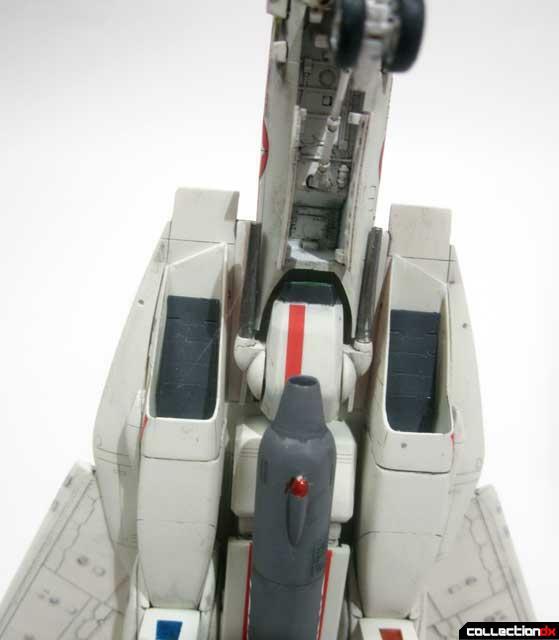 A very difficult and time consuming kit to build but a rewarding Macross kit when finished. ©2012 Article and photos by Leonardo Flores and CollectionDX. I'm definitely glad to see you enjoy this kit. It's certainly a better fate for it than a harebrained idea of a transforming kitbash. Yes never noticed that gap until you mentioned it! Wow! This is beautiful work, Leo - both the article and the buildup! Great pictures showing off the details. And all your comments about the kit's bugs, photoetch part options and your painting/detailing techniques are greatly appreciated. I really do hope to build one of these Hase kits someday (I had the clear blue 1J, but sold it before I built it), and this will be in my research pile before I start! 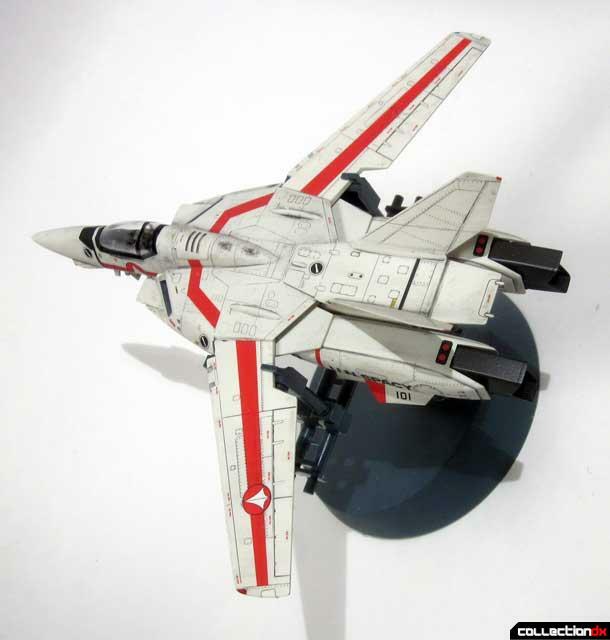 Be sure to check out the VF-1S Hikaru I did a few years ago, just click the Hasegawa above and it will take you there, that article was also involved as it was the first one with photoetche where as this one I wanted to build it out of the box. 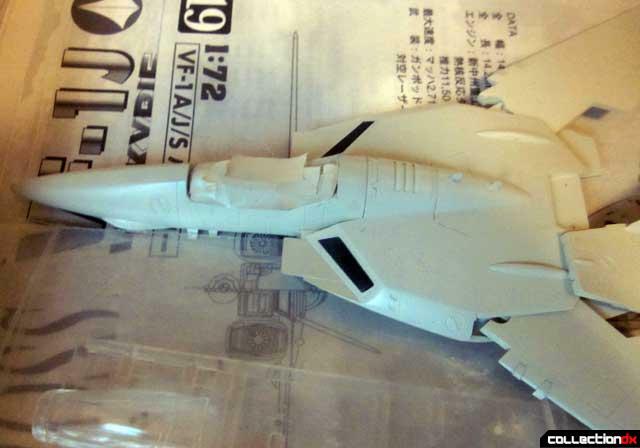 I'll be painting the Hasegawa VF-1 Super Valkyrie very soon, I'm sure the review will be up within a few months also with reviews of the Macross stands and VF-1 photoetch. 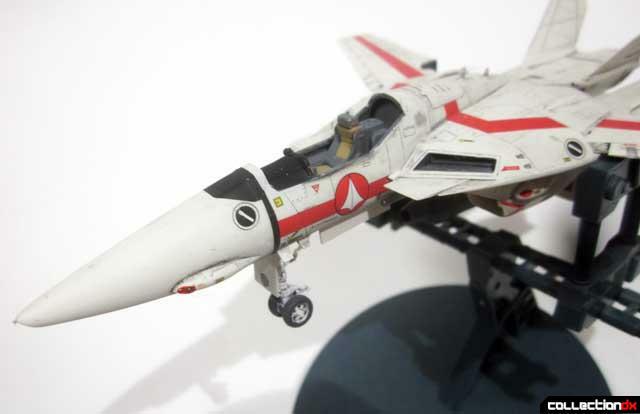 I also have the VF-1A which I plan to use the Jasmine Model photoetch sets and the new VF-11 also using the Jasmine photoetch kits. I'll be ordering those Jasmine sets on Friday. I love those clear kits and I want to do something special, so special that i haven't even figured it out yet! Let me know if you have any issues and I might be able to help out. This came out great considering the few mold shortfalls and gaps you had to deal with that, let's face it, happen with many kits, even some of the top quality ones. I feel it's almost like a test for the true modeler (which I am not lol), with the company saying "Hey, we got it this far, you just clean things up a bit more". LoL. Very nice finish job, I am very interested in the panel line and washing technique! The Gunze Sangyo Mr. Color paints are great from what I have heard. My dad has not used them but he has used the Gunze Sangyo Mr. Surfacer 1000 Primer which is supposed to be very very good from what we were told (this was years ago, so I don't have a current example). I still expect a build up of the Frau Bow and Lapridas (spelling? )kits you got from me at the Summit, along with a full review of them of course! I'll let you know if I decide to get rid of any other kits as well. Great to put an Avatar to a face! Thanks for the reply and model kits, it is greatly appreciated and great meeting you in person. Like I said in the VF-1S review building these kits is like a final for a test for a modeler as its takes all of ones techniques they have learned and asks you use each one to the best of ones ability. It really is a pain to build these kits but they are so rewarding when finished! I'll be inserting a photo of the items I use to wash soon so you can pick them up from an art supply shop. Also keep in mind Mr Color has two thinners, one to thin the paint and another to clean up the paint. Guess what I used on this one? : X Yes I used the clean thinner to thin the paint and I had some adhesion issues. Next time I will get the correct thinner so be careful! Mr Surfacer is the best! I use it for everything! Yes I have the Fau Bow and Laputa kits on my shelf, I'm ordering hobby supplies on friday (I need some spray primer) so I should be starting on those soon. Thanks again for the reply and glad you are doing well! Glad you are well also. Just wanted to ask please try to not forget the "Mr." portion of my username...apparently here and on the other boards there is another friend of ours that goes by just "Ginrai" (I have always been Mr. Ginrai for years now) and I use the avatar to help differentiate me. Just don't want people to get confused.